Wow, talk about being late to the party with this blog post! I must be one of the last bloggers to review the cult Emma Hardie Amazing Face Natural Lift & Sculpt Moringa Cleansing Balm but nonetheless, I wanted to add my two cents. I purchased my tub of the Emma Hardie Amazing Face Natural Lift & Sculpt Moringa Cleansing Balm earlier in the year and remember being surprised at the price. Whilst it's by no means a budget product, I had anticipated spending more than the £34 for 100ml particularly because I used to be a devotee of the pricier Eve Lom cleansing balm (we're talking years ago before my skin decided to become acne prone & in the days when I wasn't so fussed about mineral oil). The flaws in the packaging are well documented. First up, it's presented in a tub- as tends to be the case with cleansing balms. Regular readers will know that I find tubs to be messy and unhygienic. I understand that since I purchased my Emma Hardie Amazing Face Natural Lift & Sculpt Moringa Cleansing Balm, it has been repackaged so the taller jar (which was somewhat awkward as I neared the end of the product) has now been replaced with a short, squat jar containing the same amount of product. What I fail to understand is why on earth the company spent time and money redesigning the packaging yet from what I hear, the basic design & its flaws remain the same, it's simply the shape of the tub which has changed. My tub has cracked, leaked and is certainly not suitable for travel. It's such a shame because I really feel that the poor packaging takes away some of the luxurious quality in what is otherwise a very indulgent and enjoyable product. This isn't the thickest of balm textures which I've come across so I'd love to see it presented in a sleek and functional tube. Despite the packaging flaws, Emma Hardie Amazing Face Natural Lift & Sculpt Moringa Cleansing Balm is enjoyable to use, with an indulgent spa-like scent thanks to the inclusion of high quality essential oils (it's worth noting that the high amount of essential oils- & specifically citrus oils- may prove irritating to those with very sensitive skin but otherwise, it's suitable for all). As tends to be the case with cleansing balms, the texture lends itself well to facial massage. A little goes a long way and the golden balm melts into the skin, lifting off makeup (including heavy eye makeup) easily. I don't actually follow the directions which state "mix a few drops of warm water with a little Moringa Cleansing Balm in the palm of your hand to create a cream. Apply to the face, neck and eye area using circular motions & massage thoroughly to melt away makeup, excess oils and grime. Always remove with the unique dual action polish and perfect cleansing cloth." Instead, I follow the hot cloth cleansing method whereby I apply the balm (not mixed with water) directly to my dry skin and remove with a basic flannel/ washcloth. Perhaps mixing a little with water would make the product go even further but nonetheless, I've been impressed that my tub has lasted for months despite using it most nights. I find the ritualistic aspect of removing the balm with a hot washcloth therapeutic and what's more, the light buffing motion makes for a gentle yet effective manual exfoliation. My skin never feels dry or tight after using Emma Hardie Amazing Face Natural Lift & Sculpt Moringa Cleansing Balm, simply clean, cared for and with a glowing appearance. What's more, the balm can be used as an all-purpose balm to treat dry areas or, my favourite, applied to skin and left on for 10 minutes as a mask (this works particularly effectively if you take a hot, steamy bath whilst sitting with the balm on as a mask) - skin is left looking film-star radiant. 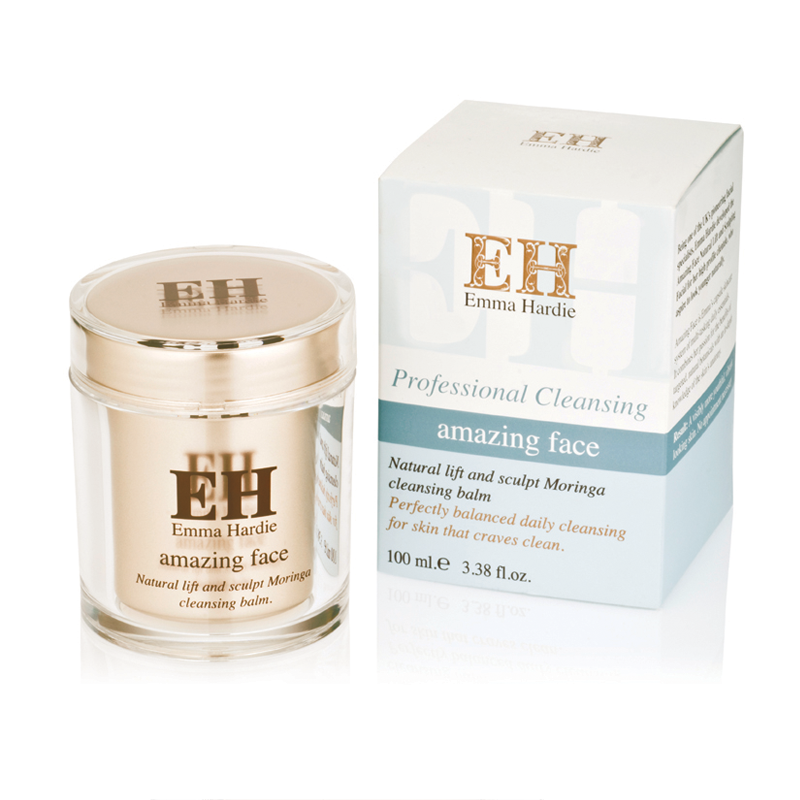 Emma Hardie Amazing Face Natural Lift & Sculpt Moringa Cleansing Balm is a much hyped product but I feel that it is deservedly so and would highly recommend this.